*What an emotional day today. I felt like Cosette was back in high school during her senior year, and all the things she participated in were coming to an end. Now it is her senior year of college at the University of Idaho. Today we went to Moscow to see Cosette perform in her final marching band performance on the field in the Kibbie Dome. She was also one of the graduating seniors in Marching Band recognized at half-time. Yes, I was teary. Yes, I was proud. Yes, I was just dropping her off in the Tower yesterday to move her into her dorm room in French Hall, and now she is about to finish her first semester of her senior year. *Cue the music.....Sunrise...sunset...sunrise....sunset.....*. 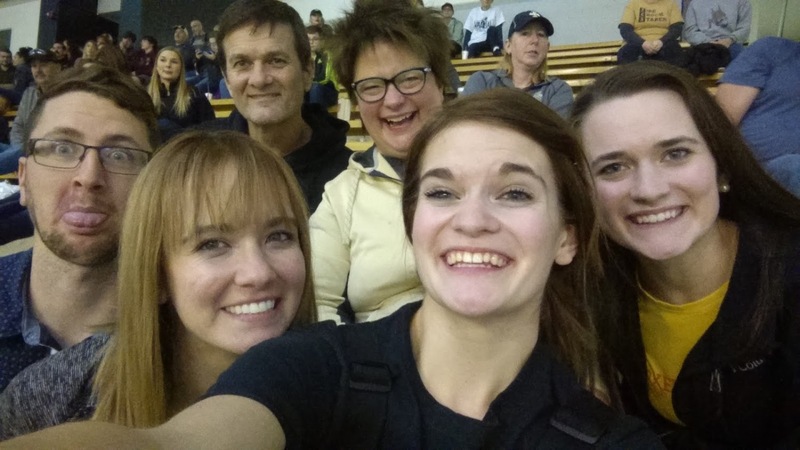 *It was also wonderful to have the whole family together at the Kibbie Dome. Zoe drove up from Caldwell this morning, and, as a mother, I really cherish these times now when the whole family is together. And we will be for a week, which will be so wonderful. *I headed for Moscow this morning about 9:30 a.m. I picked up one of the KHS teachers, Kelton Enich, because she was nice enough to take over Paul’s duties at Post Falls High School for the District Drama competition so he could join me and go to Cosette’s final performance. On the way home from Moscow, we found out three of his drama students made it to State Drama competition. Congrats to Savannah, Harley and Daighla!! *As I was on the road to Moscow, Debbie and Bill transitioned over to our house with a few of their things, and their Corgis Maggie and Charlie. They are having their kitchen and living room area remodeled, and their hardwood floors are being varnished the next three day, so they are staying with us until Tuesday. Debbie had a little too much excitement when she first arrived, when Archie escaped out the front door and she had to chase him down. He finally went into the Yoke’s grocery store, which is about two blocks from our home, and someone caught him, and she was able to get a leash on him. Archie is a fast runner, but fortunately loves people, so someone was finally able to grab him in the store. *When we all arrived back in Kellogg after the game, we heard of Archie’s escapes from Bill and Debbie, we focused on Paul, the birthday boy, for a while, and had dinner, and he opened up a present from Cosette, Zoe, Molly and Travis. To give you a little background, we do have a portion of our backyard that has been designated The Harry Potter Garden. The kids felt like their dad needed to plan another garden in their backyard, so they gave him a couple of items for him to start planning The Narnia Garden, complete with a lamppost that is solar powered, and the face of Aslan. Paul with the beginnings of his Narnia Garden. *So, just in case you were wondering, as we all went to bed tonight, the Roberts Inn was filled with the following....Two parents, three children, one son-in-law, a brother and sister-in law, one Pomeranian, one Catahoula, two Corgis, three cats, two bunnies.....17 living and breathing mammals in all!! And it is all good!